"Empowering you to know that you know"
With me by your side, you will begin to understand the mysteries and wonders that surround you. UNCOVER: You will become aware of the impact your structural, chemical (nutritional), emotional and energy integrity is having on your health and how they can impede but also be an enjoyable contribution to you maximizing your gifts. You have to overcome a large number of the problems that have beset you and you need to get clear on what and how to get them taken care of, this is where Dr. Hegel comes in, she can help you uncover the true causes and explore the best ways to get you the uncover what you are looking for and embrace it. EXPLORE: There is a point beyond which all who seek the path to enlightenment must travel, and this Dr. Hegel can show you, now that you are ready. You may understand the structural and emotional aspects to your situation, however the nutrition and energy aspect may be new to you. This is where exploring new possibilities comes into it! The only way to get a different result, is to do something different. Working with Dr. Hegel, you will find yourself in a very safe space to uncover, explore and embrace the possibilities that await you. Are you ready to explore Your Gifts? You are in the right place. EMBRACE: In working with Dr. Hegel, you will create awareness, find strength, gain enlightenment, access your inner wisdom and welcome transformation structurally, chemically, emotional and energetically all to Maximize Your Gifts. To be ready for the new directions and possibilities you seek, she is one to help you build and restore your body, life and living and gifts. She will help you to climb out of the stasis of everyday life and into the place where all potential awaits you. In choosing to walk with her, she can show you inspiring ways of changing your old life for a new one. In working with Dr. Hegel, you will uncover, explore, embrace, restore, renew, find new opportunities, break old patterns, recognize the end of phases, leave outworn paths and transform. To change your old life for a new one, courage is going to be required and a lot of it. She will be there to help you discover the resources that lie deep within you – gifts you may not know you possess. Dr. Hegel is there to support you in times of need, when challenges become overwhelming, when strength is required to make even an inch of progress along the way. Together, you will journey into fear and at its heart find courage to overwhelm it. In working with Dr. Hegel, you will find the courage to advance, understand your loss of power, recover lost strengths, maintain calm and transform fear into power. Visit the "Where do I start?" page to learn more about Private Sessions, Couple Sessions and Free video series and MORE! Clients are reporting relief, harmony, peace, increased self esteem and self worth, increased trust with their knowing, increased energy, improved mental clarity and focus, exceeding goals and targets with ease, increased health, and vitality, emotional clarity and strength; they have also reported improved relationships, better sleep, decrease in stress, improvements in glucose levels, including cardiovascular and respiratory, hormonal and digestive functioning. Getting your Bars Run changes everything. Is NOW the time? 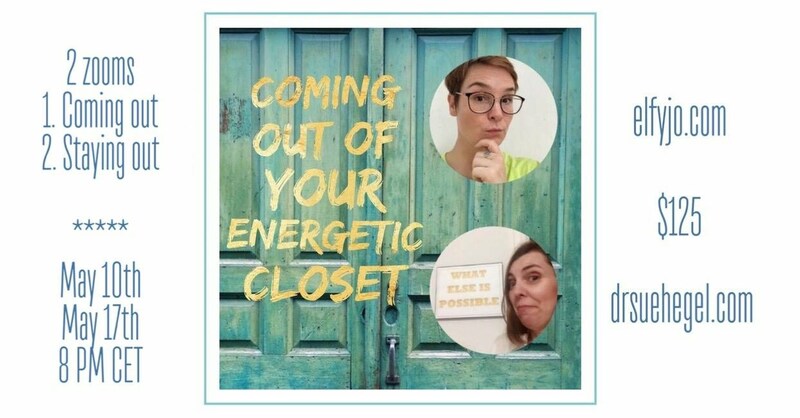 How do you know you're in your energetic closet? It is when things are just not right in your world. Visit Elfy and Dr. Sue as they invite you to something different!! In these two ZOOM calls we are going to give you a lot of energetic tools to work and play with to change your reality. Dr. Sue Hegel DC and Elfy Jo are a powerful magical combination to facilitate change for you. We do this with Sue's extensive medical knowledge, her mad energetic skills and Elfy's gift for changing molecules through music, along with her set of energetic gifts. © Texas Family Wellness. Texas. 2018. All Rights Reserved.